Do you ever wonder what digital tools and software other people use to run their businesses? I do – and I get asked about various and sundry software solutions a lot, too. 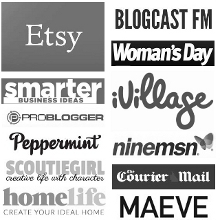 So, this week, I decided to do a big round-up of all the digital tools & software I use to run my own handmade business – and Create & Thrive, as well. I discuss what I use and why in detail in this episode – covering social media tools, website design, shopping carts, time management, photo editing and graphic design, file storage, audio & video recording and editing, outsourcing, book-keeping… and more! Take a peek behind the scenes of my businesses, and see how I keep everything running (mostly) smoothly! P.S. While finishing these shownotes, I realised I left one or two things out of the ep. I’m sure more will come to mind, so I’ll update the links below if that happens! Leaving a review on the C&T FB page. Leaving a review on iTunes. Donating a few dollars towards the costs of producing the pod. Joining the Thriver Circle – without the members of the Circle, this podcast would not be possible. FYI if I have (R) next to a link, this means it is a referral or affiliate link. This means that if you click that link and sign up to the service, I get some form of reward. If you’d prefer to avoid that, just google it.) I am only listing and recommending tools and software that I use myself and would recommend to others wholeheartedly. My main social media are Instagram, Facebook, and Pinterest. I used to love and use Twitter a lot (not so active on there now) and I have a Google Plus account. I’m also starting to use YouTube more. Handmade sales venues: Etsy (R) (I’ve also sold on Hatch.co, Dawanda, madeit). My own websites are created with WordPress self-hosted, and I’m currently transitioning to Divi Theme (R)(and lots of plugins – I’ve used a free theme called Pinboard previously on some sites). My web host is Dreamhost (R). I’ve been with them for over 10 years and have always been happy with their service. My current shopping cart on my e-commerce website is Ecwid, but I’m moving to WooCommerce. I use E-junkie & Paypal to sell my C&T courses, ebooks etc. I use Trello to keep track of my work and life, and I also use the Cal app on my android phone as my appointment-keeper (as well as some paper in my office – a whole-year wall planner and a weekly desk planner). I use focusbooster on my computer when I really need to get stuff done – it’s a pomodoro-style app. I schedule work periods of 45 min and rest periods of 15 min each hour. I use Canva for all my graphic design. I use Picasa (now transitioned to Google Photos) for most of my product image editing. I use GIMP for any image editing I can’t do with Picasa or Canva (it’s sorta like a free version of Photoshop – and it’s open-source). I use Snapseed on my phone to edit photos on the fly – especially for Instagram. Insta Downloader is the app I use to repost another person’s Instagram post. It has awful ads, but it works! I use Grum on my desktop to schedule up my Instagram posts once a week. I use Dropbox to store all my business photos and documents so I can access them from any of my devices. I use Google Docs for some of my business docs, too. I currently use Xero accounting software for my book-keeping. I forgot to mention my mailing list software! I use Mailchimp (R). I use Skype for all my podcast interviews. To record them, I use Amolto Call Recorder. I record my solo shows and do all my podcast editing in Audacity. For Thriver Circle calls, as well as calls for my courses, I use Instantteliseminar. I still use Windows Movie Maker to edit my videos. I use screen-recording software called Screencast-O-Matic to record my workshops for the Thriver Circle. I am currently using Airtasker to get my podcast summaries written.